After a few weeks of arctic conditions the snow has moved south, thereby becoming newsworthy to the BBC, who only have to look out the window of their offices in London to report it. This would be perfectly fine with me, if only the cold weather would leave Scotland altogether to go infest southern England, like an annoying elderly relative who takes turns to inflict himself on his offspring (King Lear’s daughters had the same problem, I seem to remember). Alas, dear reader, it hasn’t budged. 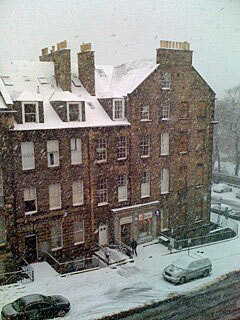 So it’s still bitterly cold in Edinburgh, below zero, and snowing just enough to freeze and be treacherous. I start the day immersing my fingers in a mixture of boiling water and antifreeze to get them to work (well, it helps with the car…), and sullenly waiting for my Amazon parcels to arrive (latest delivery estimate: 8 December; looks like Tiny Tim isn’t going to get that new crutch for Christmas after all). So, while I sit at home and work on my Vitamin D deficiency, I can knit, albeit very slowly with frozen fingers. (People think I’m cracking my knuckles when all I’m doing is shattering the ice.) 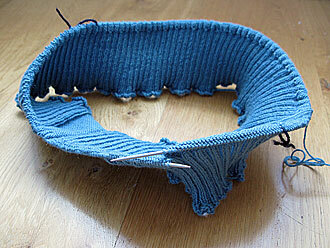 I’ve finished the 3 inches of ribbing at the bottom, and made the increase into the body. 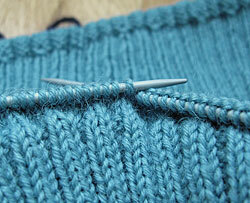 If you recall I cast on 384 stitches for the ribbing (plus 20 stockinette stitches for the steek, making 404 in all). It’s customary to increase by 10%, and 10% of 384 is, of course 38.4. I decided to round this up to 40, on a whim, and to err on the side of caution (too big is better than too small – though I grant you 1.6 stitches isn’t going to make much difference). So I now have 424 stitches to play with (or 212 per side), plus the 20 stitches of the steek. Good progress on the novel. I’m up to 35,000 words (about half a standard Graham Greene-sized book), though I suspect very few of them will make it through to the final cut. wish you and Margaret also a happy Christmas. The colour is wonderful, your bread smells also “heerlijk”. In the Netherlands is it also cold and snowy but in the house is it warm and knitting a warm sweater for my husband hold me warm :)! Although we are not to the antifreeze stage yet (got pets around so I try not to have that anywhere near them) here in Virginia, on the Chesapeake, but we have had our first snow and the winds are definitely out of the Great Lakes; i.e., NW, so I it looks like Ol’ Man Winter is here to set a while. I am still working on Christmas sweaters, but it looks like they will be New Year’s sweaters. What my first foray into knitting sweaters has taught me is take the the first EDC and multiply it by 10 and then maybe I will finish in time. I have enjoyed your blog so much this year Gordon! Here’s wishing you and Margaret a very Wonderful White Christmas and a very safe and prosperous New Year! See ya on the flip side. The Stollen looks wonderful and puts my purchased Panatonne to shame! Oh, Good Grief! it’s snowing again! I’m going to go cry in my rum! Merrie chrimbo to you both, I hope you are not eating all that bread and stollen yourselves as that may prove to be the last 404 st cast on that you make. I am facing a 500+ cast on this chrimbo hollidae. In between bouts of casting on I hope to bring myself to read your literatcher, only the thought of starting is making me feel slightly funny, like reading someone I know’s poetry. It could be good, but it could be disastrous for our on-line rather one-way relationship. But I’m not worried. Basically, the story is a violent, supernatural, fantasy thriller for young adults, written in a self-consciously literary, poetic style. So I suspect (and some initial feedback confirms) that readers of violent supernatural fantasy thrillers will find the writing pretentious and gets in the way, whereas readers of literary fiction will deplore the subject matter, and wish I’d written a book about a middle class academic in a mid-western university suffering a mid-life crisis. For what it’s worth, today is 1-1-11.